Cuttack:58/118/18: Odisha DGP RP Sharma today handed over the insurance claim settlement cheque of Rs 8 lakh to Manjari Majhi, sister of martyred sepoy Sanjaya Majhi of DVF. DGP Sharma handed over the cheque to the martyred sepoy’s next of kin in a simple function at RK Padhi Memorial Hall (IPS Mess) Cuttack. The claim was settled by HDFC bank. Sharma appreciated the effort of HDFC Bank for an early settlement of insurance claim. He also called upon the bank officials to continue such kind of promptness in future days also. Notably, Sepoy Sanjaya Majhi of District Voluntary Force achieved martyrdom while fighting in the line of duty on April 10, 2018. He sacrificed his life in a landmine explosion during a combing operation near Sakata village under Muniguda PS in Rayagada district. 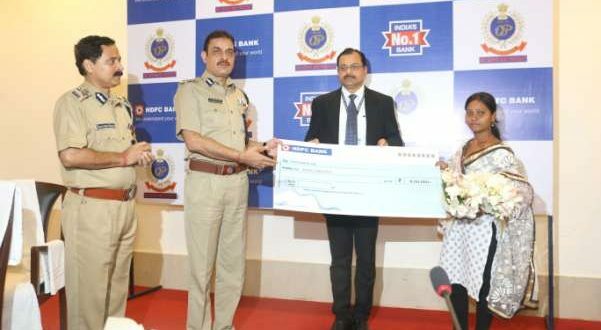 Regional Head HDFC Debashis Senapati along with other Senior Officers of HDFC Bank and Odisha Police were present in the programme.